Yes, among other things. I’m Musical Director of Gardiner Street Gospel Choir, Sandymount Gospel Choir , the Waltons School of Music Sing Your Heart Out Choir,the Brown Thomas WorkPlace Choir and the Portmarnock Singers. In the past I’ve conducted choirs in every imaginable setting from workplaces to theatres, to hospitals to prisons (seriously). One of my earliest choirs, the Ballymun Gospel Choir, is now sadly disbanded but will always have a special place in my heart. I’ve been employed as choirmaster/vocal arranger for theatre a number of times, including by the Abbey Theatre, the Gaiety School of Acting and RTE Radio One. In 2009 I conducted the Irish premiere of The Poverty Requiem, a piece composed by Dutch composer Peter Maissan to mark UN Annual World Poverty Day, October 17th. What’s The Gospel Project then? Is it a choir? It’s a vocal harmony group, or kind of a boiled-down choir. Where a choir has a group of people singing soprano, alto, tenor, bass etc….. 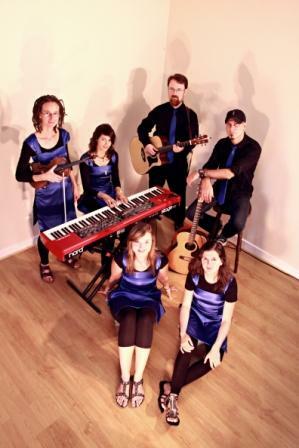 The Gospel Project has just one person singing each part, each of whom also plays an instrument (keyboard, flute, guitar, fiddle and percussion). My role as Artistic Director is to lead the ensemble, create our vocal arrangements and handle the administrative side, as well as being a performing member of the group. So where did you learn to do all this? I hold a Music degree (honours) from Trinity College, Dublin, and a Masters in Composition from N.U.I. Maynooth. and have received additional conducting training as a private student of Robert Houlihan. Like most musicians, I’m always learning, and always striving to develop my skills as a musician and conductor. My most recent bout of self-improvement was in Summer 2016; I received a Travel and Training Award from the Arts Council of Ireland to enable me to attend the BodyMind and Voice Course run by the VoiceCare Network in Minnesota, USA. See also the Arrangements page. Are your arrangements available to other choirs? Thanks for your interest! The answer is some of them, depending on the song & the copyright issues involved. Drop me an email – cathymcevoymusic@gmail.com – letting me know which song(s) you’re looking for and i’ll do what I can.